Pear Creek Cottage: The Beloved Bears are HERE! The Beloved Bears are HERE! Ever since reading Bonnie Gray's book, "Whispers of Rest", I have been on a quest, a journey, learning to live as the Beloved of God. This book, and the process of change, has been eye opening and just what I needed at just the right time. Like many folks, I've struggled with the need for approval. Feeling inadequate. Trying to gain acceptance. One of the patterns that I've developed has been to work harder...to gain more. The harder I work, the more others will like me. This has worked like a charm! It has turned me into a workaholic, an emotional "stuffer", and a stressed out human being. My relationships have suffered, my health has suffered, and my soul has suffered. Not a good way to live ones life. I really enjoy creating with my hands and my heart. My head is full of creative ideas and possibilities. My creative process is usually an extension from what I am learning and discovering, emotionally, physically, or spiritually. As I've been digesting the truths in the book "Whispers of Rest", I like to create little tangible reminders of the precepts and truths I'm learning. This helps reinforce the lessons I'm learning. A way of reviewing and remembering. One of the ways I am choosing to remember is through this adorable little stuffed bear which I made. I named them, "Beloved Bears". A truth to remind me that God takes the pieces and the patches of my life, and stitches them together with His threads of grace and mercy, to create 'ME'. His one of a kind creation that brings Him joy. That is hard to comprehend at times. I bring God JOY! Not my workaholism. Not what I do. Not what I look like, or what I say. But me, just as I am...I bring Him JOY! He delights to be in my presence. WOW! Even just typing the words, stops me in my tracks once again. I have wanted to learn, embrace, and live these truths. The idea of the "Beloved Bears" came to me as a way I can practice remembering. I thought, if I put magnets inside the bear, I can stick him on the fridge, in my office....on my exercise bike...wherever I can see him and be reminded of the truth he represents. Now, you know a little of the back story how the bears came to be. To me, when I see them, they make me smile. They bring me joy and hope. I hope they do the same for you. You are special. You are unique, one of a kind...made for a specific purpose. You are BELOVED! Patches and Daisy will be accompanying me to the Business Boutique in Nashville, Tennessee. 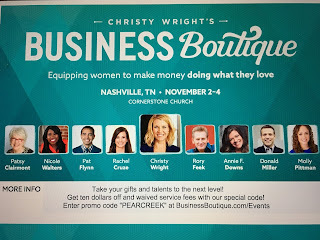 This is an incredible opportunity that has been opened up to me. I am still in process getting ready. There have been obstacles in the way which should prevent me from attending; like my husband losing his job. However, our God is greater, and stronger, and bigger than the obstacles, and we are trusting that He is leading us, even when we don't understand. 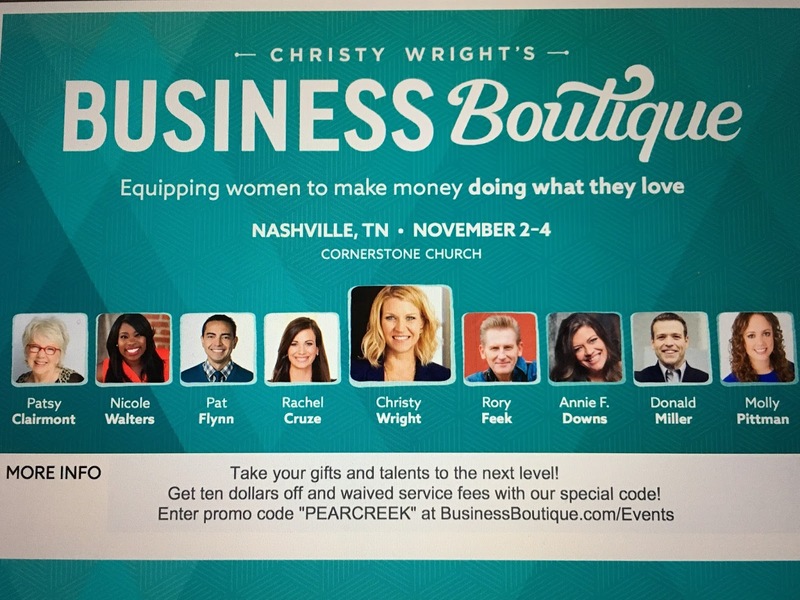 You can use the Coupon Code: PEARCREEK for a discount to attend the Business Boutique.